You are leaving www.rivernorth.com and will be redirected to an external website. RiverNorth is not responsible for the content of external websites. Shareholders of RiverNorth Funds can access their account online. Accredited investors may download monthly fact sheets and partner letters here. Limited partnership investors can access fund statements and information here. Shareholders of RiverNorth Marketplace Lending Corporation (RMPLX) can access their account online. RiverNorth is an investment management firm founded in 2000 that specializes in opportunistic strategies in niche markets where the potential to exploit inefficiencies is greatest. RiverNorth is an institutional investment manager to registered funds, private funds and separately managed accounts. 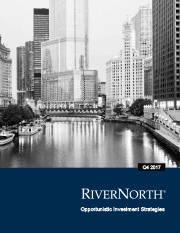 Provides an overview of RiverNorth and its strategies. Keep up-to-date with RiverNorth by subscribing now. We are an investment management firm specializing in opportunistic investment strategies. Get updates from RiverNorth in your inbox. This site does not constitute an offer to sell or a solicitation of an offer to buy shares of the Funds in any jurisdiction in which such offer, solicitation, purchase or sale would be unlawful under the securities laws of such jurisdiction. An investor should consider the investment objective, risks, and charges and expenses of RiverNorth's open-end mutual funds carefully before investing. RiverNorth open-end mutual fund prospectuses contain this and other information about RiverNorth's open-end mutual funds and should be read carefully before investing. An investor can obtain a copy of RiverNorth open-end mutual fund prospectuses at rivernorth.com/literature or by calling (888) 848-7569. To join the RiverNorth email distribution list, click here. Unsubscribe here. ©2006-2019 RiverNorth Funds. All rights reserved. The website is controlled and operated by RiverNorth Capital Management, LLC from its offices within the State of Illinois, United States of America. RiverNorth® makes no representation that materials on the site are appropriate or available for use in other locations, and access to them from territories where their content is illegal is prohibited. The information provided on this website is not intended for distribution to, or use by, any person or entity in any jurisdiction or country where such distribution or use would be contrary to law or regulation or which would subject RiverNorth or its affiliates to any registration requirement within such jurisdiction. Shares in the RiverNorth funds are offered by prospectus only. RiverNorth private funds are only available to suitable, accredited or qualified investors via effective offering memoranda. Business Continuity - RiverNorth Capital Management, LLC maintains a business continuity plan designed to minimize disruption in services and allow for the restoration of critical resources should access to our offices or systems become unavailable. This plan identifies mission critical processes and provides for their recovery in the event of various types of business interruptions. This plan is continually evaluated and amended as necessary to ensure that the impact of any business interruption is minimized. Information on this website is provided "AS IS" without warranty of any kind, either express or implied, including, but not limited to, the implied warranties of merchantability, fitness for a particular purpose, or non-infringement. Some jurisdictions do not allow the exclusion of implied warranties, so the above exclusion may not apply to you. The data set forth on this website is for informational purposes only, and no warranty is made that the information is error-free. IN NO EVENT WILL RIVERNORTH CAPITAL MANAGEMENT, LLC BE LIABLE TO ANY PARTY FOR ANY DIRECT, INDIRECT, SPECIAL OR OTHER CONSEQUENTIAL DAMAGES ARISING OUT OF ANY USE OF THIS WEBSITE, OR ANY OTHER HYPER-LINKED WEBSITE, INCLUDING, WITHOUT LIMITATION, ANY LOSS OF PROFITS, BUSINESS INTERRUPTION, LOSS OF PROGRAMS OR DATA ON YOUR EQUIPMENT, OR OTHERWISE, EVEN IF WE ARE EXPRESSLY ADVISED OF THE POSSIBILITY OR LIKELIHOOD OF SUCH DAMAGES. Information on this website may contain inaccuracies or errors. Information may be changed or updated without notice. We have no obligation to update information presented on this website, so information contained herein may be out of date at any given time. We may also make improvements and/or changes in the strategies and/or programs described in this information without notice. and the RN Logo are registered trademarks of RiverNorth Capital Management, LLC. ©2000-2019 RiverNorth Capital Management, LLC. All rights reserved.